Kansas, Tony Sands 26-86, Douglas 9-40. Nebraska, Clark 20-177, Gdowski 6-75, Mickey Joseph 12-66, Richard Bell 2-42. Kansas, Quintin Smith 9-169, John Baker 3-29. Nebraska, Bell 2-56, Nate Turner 1-30. Nebraska, Mills 1-2, Bruce Pickens 1-0, Marvin Sanders 1-0. Kansas, Roger Robben 13-1-14, Hassan Bailey 7-5-12, Paul Friday 6-1-7. Nebraska, Sanders 4-3-7, Jeff Mills 3-4-7, Pat Tryrance 5-0-5. 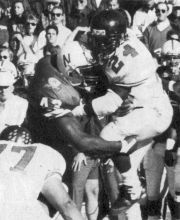 Ken Clark rushed for a season-high 177 yards and Gerry Gdowski had 180 total-offense yards to lead the Huskers past the Jayhawks, clinching Nebraska's 21st-consecutive season with at least nine wins. Clark's effort increased his career total to 2,946 yards and his season total to 1,105 as he became the second-leading career rusher in Nebraska history, and became the fourth Husker to record back-to-back 1,000-yard seasons. Gdowski's output gave him 2,004 total-offense yards on the season as he became the fifth Nebraska player to top 2,000.